While this didn’t have anything to do with Freedom’s left hind lameness, he did need to have his TMJ adjusted. He was much happier after this, and the problem explains why he was so naughty at the hunter pace. The next step in figuring out what’s not wrong with Freedom came today. My saddle fitter was in town and he also does body work. So, I asked Gary to give Freedom a “once over” to see if he found any tightness or body soreness. He did, but not in the left hind. Although Gary found no soft tissue issues and no reactivity or heat in his leg, Freedom was highly reactive to his Temporo-mandibular joint, more commonly referred to as TMJ. The TMJ joint resides just below and in front of the base of the ears on either side of the head. It’s where the lower jaw (mandible) of the horse articulates with the temporal bone. Now, Freedom has shown some unusual resistance to having his head touched. When I took him to the hunter pace, my normally obedient and well-behaved horses pitched a fit when I tried to bridle him. I have the bruises to prove it! At the time, I thought he was just excited about being in such a congested area, but in retrospect it was more likely a pain response. Gary described it as having a massive headache that likely extended well into his neck — so affecting about a third of his body. 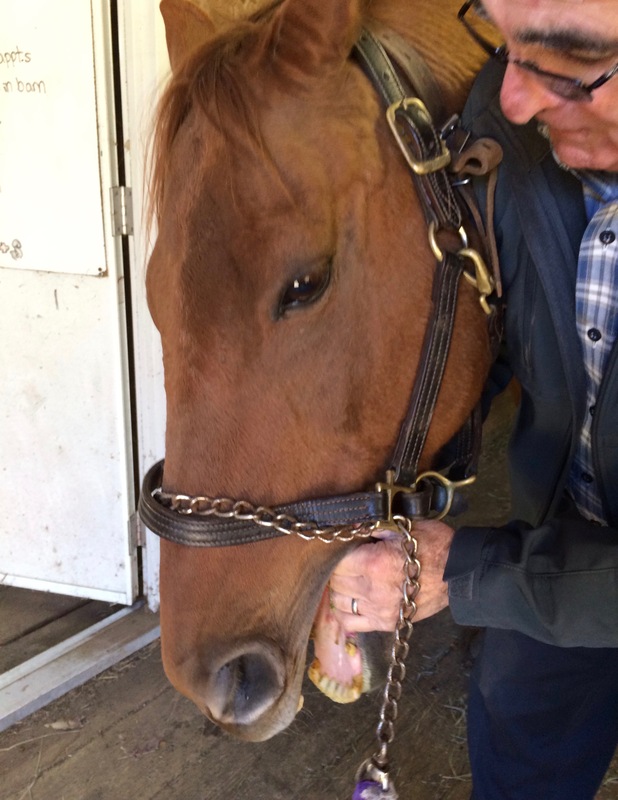 Getting the TMJ to release involves massaging the bars inside the horse’s mouth, which is easier said than done when a 1200 lb animal is trying to body slam you to keep you from touching him. Luckily for Freedom, Gary persevered and as the joint released, I could see Freedom’s eye soften and his entire demeanor changed. After some yawning he stood placidly, back to his normal self. He continued to stretch his head and neck as if testing to see if it still hurt. I know I feel that way when a headache finally goes away. Here’s a video that shows a slightly different technique for relieving TMJ pain that also might be useful. One of the systems of TMJ disorder is a horse that is reluctant to go forward at the canter, and one that may buck or jump in the air. I wondered if part of Freedom’s issue might be related to this, so I took him out for a short ride. While he felt calmer, he still had the same lameness pattern. Tomorrow the vet comes. I’m leaning toward a hoof issue and hope that there’s a definitive answer. Fingers crossed for a conclusive answer from the vet. All the same tho I find horse massage fascinating – glad Freedom was able to enjoy some!